I love a great sentence. You know the ones that just grab you and make you say, whoa! One of the suggestions I always have for the teachers I work with is that they model sentences from these fantastic middle grade novels that we just love to teach grammar, editing, and revision. Jeff Anderson, also known as the Write Guy, does this exceptionally well. He is known for making writing and the revision process fun for writers of all ages. I once was lucky enough to attend his presentation at a reading conference. If you ever get the chance, do it. He’ll knock your socks of with strategies and approaches to teaching writing. He makes it seem so easy, that you’ll feel confident enough to try it yourself. 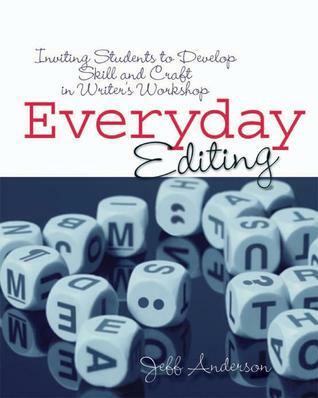 One of the books I always pick up for our new Language Arts teachers in our middle school building is “Everyday Editing” by Jeff Anderson. Lucky for us, Jeff offers his ideas in this format, too. 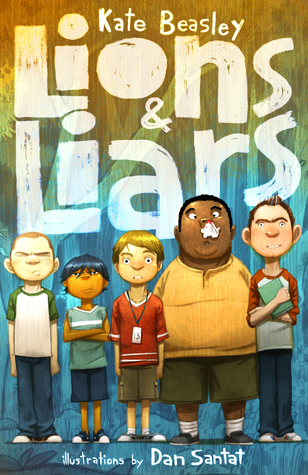 While I was reading “Liars & Lions” recently, I couldn’t help but be impressed by Kate Beasley’s written expression, and think that these would be great sentences to invite students to study and even imitate. For example, if you are trying to make your student’s writing more sophisticated why not work on subordinating clauses? “Frederick was ten. He did not cry, but if a dodgeball hit you directly in the nose, your eyes automatically released water” (1). If you are working on prepositions or you want your students to add some figurative language such as a simile, these next two sentences are hard to beat. “By lunchtime, Frederick’s nose had swollen until it looked like an ugly, overripe plum hanging off his face” (5). “The trees that he had walked past stretched strangely into the distance, like a camera zooming out” (211). Are you tired of students simply stating what happened instead of showing the reader? I can picture Frederick and Joel reaching each other as the boat swayed; their finger tips grazing each other with this sentence. “Frederick reached as far as he could without overturning the boat. His fingertips touched Joel’s but then they moved apart, out of reach” (36). Hyperboles: they are fun to read, and they are fun to write. Kids love to exaggerate. “Raj was holding his head in both hands like he was trying to keep it from falling off his shoulders” (36). Onomatopoeia is always a figurative language piece that students enjoy adding to their writing. Check out some of Kate’s examples in this next quote. “A bolt dropped and clanged against the boat’s bottom. The heavy motor tipped over the edge with a solid thud” (35). Teaching students to correctly write a list of actions in a series using commas can be frustrating. Simple drill and kill will not work alone. Let them find these sentences in the wild! “Frederick snatched the burger patty from the bottom of the boat, drew back his arm, and hurled it at the alligator. It hit the gator’s armored neck, bounced off, and plooped into the water. The alligator didn’t blink” (38). A great revision lesson when writing personal narratives is to have students go back into their story and add what thoughts and feelings they were having in that moment. They can see Frederick’s thoughts in this quote. “Okay, Frederick told himself. Pull yourself together. You can do this” (164). Something I see yearly that needs work is compound sentences. Jeff Anderson has some fabulous lessons in his book about this, as well as some free printable FANBOYS posters on his website (www.writeguy.net). “Ant Bite grabbed Frederick’s sleeve to pull him back, but Frederick jerked his arm away” (177). “He hadn’t forgotten about Ant Bite’s and the others’ plan to run away, but his victory at dodgeball had been so magnificent, that it had made the others’ plan seem no bigger than a gnat” (176). Did you catch that metaphor, too? Or what about the possessive nouns and the use of apostrophes? That’s a golden sentence right there, friends. Whether you’re an author, a teacher, or a student, we can all learn from each other’s craft. Teachers, empower your kids to notice these mentor sentences with anchor charts around your room or sticky notes while they read. You’ll be surprised at the gems they find. Enjoy reading in the wild, friends, and be sure to take a moment to appreciate the author’s written word, too. I’m a huge fan of Jeff Anderson! His teaching with mentor sentences can turn a “reluctant” writer into a writer who is amazed to find what they’ve got inside. I use the concept of mentor books when I teach writing, I LOVE the idea of focusing on mentor sentences. Thanks. Thank you for your acknowledgement of my work. I love what you’re doing. I’ll spend the rest of the afternoon thinking about the phrase “no bigger than a gnat.” Gnat is a great word, isn’t it. Thanks for the post. I’m a big fan of Kate’s books- so good! You make me blush. What a great extension!